All photos were taken in a restaurant or car with my cell phone. Please forgive the low quality and lighting. I’d tried sushi almost 10 years ago and hated it so bad I couldn’t swallow. I hated everything about it from the flavor to the texture. Even the rice bugged me. Over the years, I’ve been told I should try it again over the years and just didn’t have the stomach to try it. 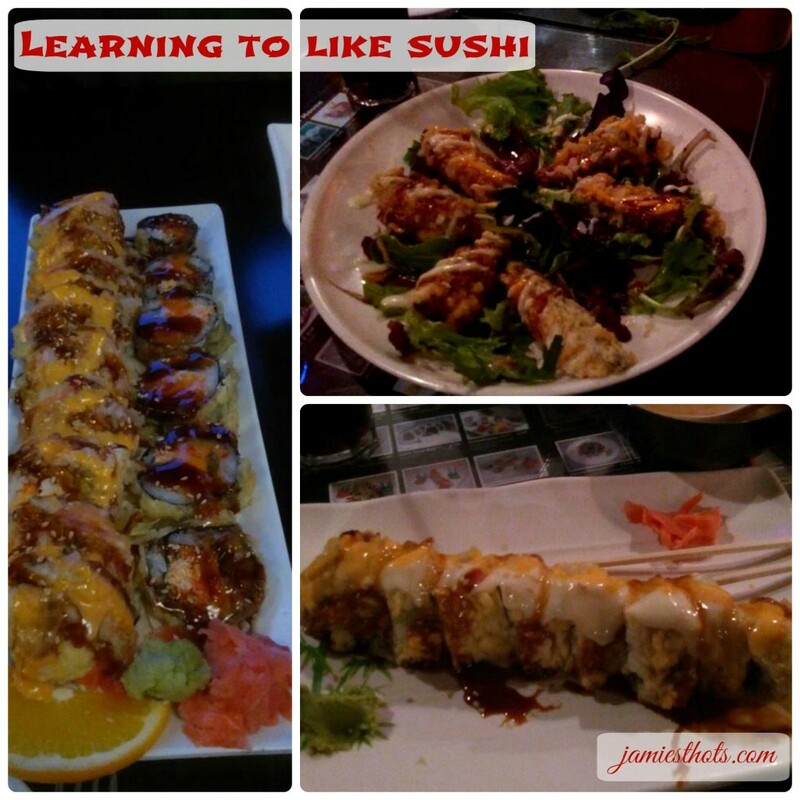 As you can see from the pictures, we now love several types of sushi and I thought I’d share a few tips that we learned about trying sushi and a few places in Northwest Arkansas that are great places to try! In the last year or so, John and I have heard from several friends that we should try this sushi stuff and we were both reticent but also willing to give it a try. We ordered a variety of types at a local restaurant that is considered high quality. What we got ranged from disgusting to at least edible. Eww. Another time we went back to the same restaurant (they have lots of items we love) and we decided to try sushi again, but something a little more basic. I got a tuna roll and John got a spicy crab roll. I tried the tuna roll with the traditional “stuff” that you’re supposed to use with sushi like wasabi (green mush), ginger (pinky stuff), and soy sauce. All were gross to me. Not all sushi has fish. Some rolls are vegetarian and this one (the Tyson roll) at Sushi house has chicken. I had ordered a bento box that night, which means I had small servings of three different things. One was teriyaki chicken and I tried the tuna roll in that sauce. It was amazing. Simply amazing. I wanted to order more but knew that would be overboard. John also loved his spicy crab roll. Not all sushi is raw. In fact, many rolls are not. 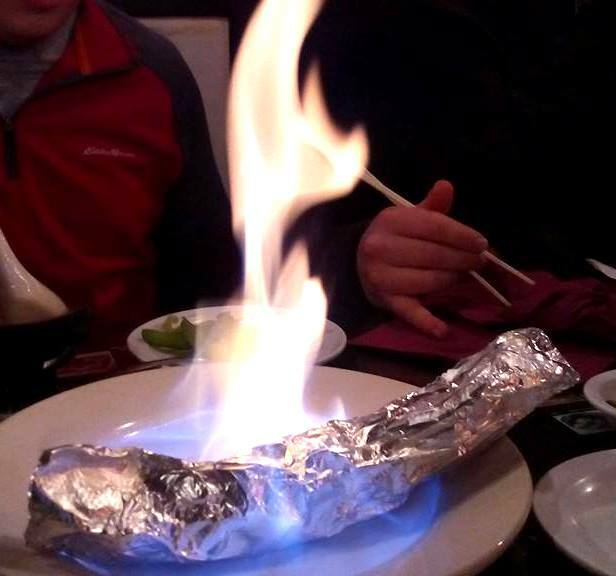 This is the Flaming Volcano from Sushi House. It has raw meat and spices in the foil and they light it on fire at the table. That of course cooks the meat. So delicious! We thought OK, if we liked these we might like other sushi. We decided to try sushi at a couple different places and now, I have to admit that we’re hooked. At that point, we knew we needed to stick with the rolls and not the sashimi (raw pieces of fish steak). The rolls have the rice and a variety of ingredients and sauces so they are a bit more pleasing to our taste buds. We still chuckle at the idea that we were supposed to try sushi three times before we “learned to like it.” I still think that phrase is misleading. It’s not that a person will acquire a taste or just decide to like the sushi. It’s that there is so much variety that if the person tries enough different types, there will probably be something they end up liking. So far I think our favorite two rolls are from Ginger in Fayetteville. The one on the left is John’s fried crawfish roll (how more Arkansas can you get?) 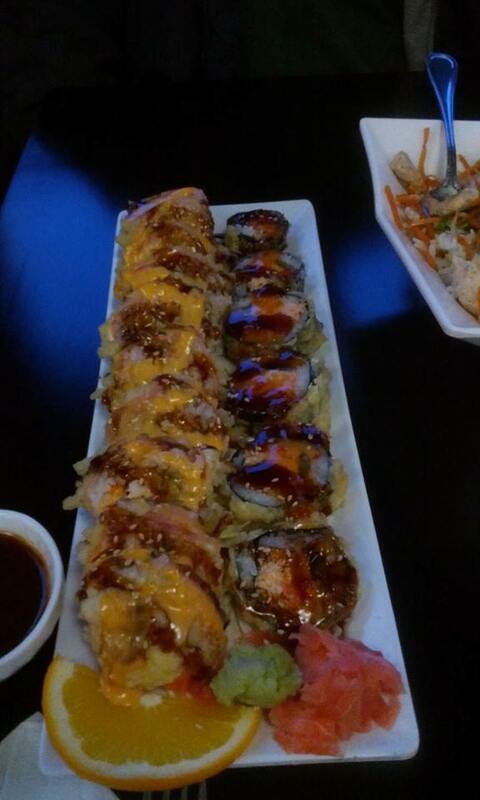 and the one on the right is the spicy crab rangoon roll, my all-time favorite. Right now I would say we have two favorite places to get sushi: Ginger Rice & Noodle Bar in Fayetteville and Sushi House in Bentonville. We’ve also tried sushi from Walmart (so-so), Harp’s Food in Fayetteville (pretty darn good for a grocery store. I’ve gotten it several times. I love their various Deluxe California Rolls), Dillons in Wichita (not bad but some of it had the raw pieces of sashimi that I can’t stand), JD China in Fayetteville (pretty good but it’s mostly rice and all they have is a California roll), and Meiji in Fayetteville (incredibly fresh but still getting used to their choices. That’s where I tried the tuna roll in the teriyaki sauce). We got a variety pack at Dillions grocery store in Wichita to try in our hotel room over Thanksgiving weekend. 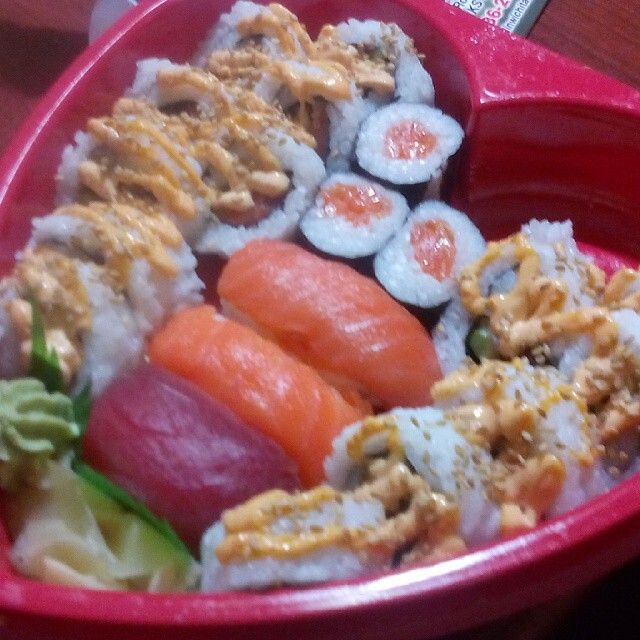 I did not care for the pieces with the raw tuna and salmon (the pinky purple strips in the middle of the heart). In our journey towards liking sushi (oh doesn’t that sound dramatic), I’ve come to realize a few things that might help someone wanting to try sushi. Learn about sushi online so you kinda know what you’re ordering. What might sound really weird is just another word for something you already know. We learned a lot on this site SushiFAQ. Consider getting one roll to share along with another meal (at Ginger we love to share the Asian BBQ Korean rice bowl). I would definitely stick with the rolls (sometimes also called maki sushi). Like I said, they have more variety and often have cooked choices. Try cooked varieties first. The tastes will be more familiar and give you a better feeling for what you like. You can get rolls with just the meat cooked or the entire roll could be baked or fried. Another option is to try vegetarian versions first or along with the cooked rolls. Remember that all ingredients in food taste different based on how they are prepared. Really profound, right? I love both tuna and salmon but found I’m not so fond of the raw varieties. I hate shrimp and crawfish with a passion but in small doses, I like it in sushi. Don’t assume you have to like what others say you will or should like. For example, neither one of us like ginger/wasabi. I don’t like soy sauce but John likes it on some rolls. John is not a fan of California rolls (usually crab or tuna with avocado and cucumber I think). Always read the description of the rolls because each restaurant will have their own take on a roll. For example, I think that the mango rolls from Sushi House are completely different from the ones at Ginger. I prefer the Sushi House version. Many restaurants will have “local” rolls that can be fun to try. For example, in Northwest Arkansas we have several places that have a Bentonville roll, Walmart roll, Sam’s roll, Tyson roll, and a JB Hunt roll. 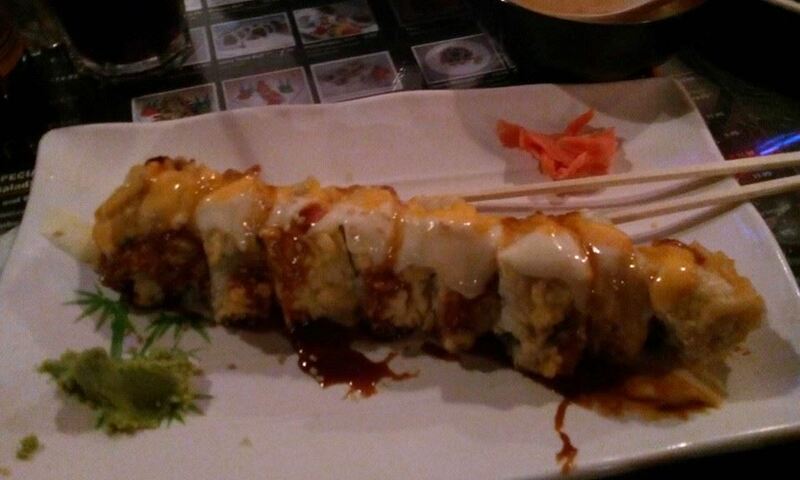 The only one of those that makes any logical sense is the Tyson roll because it has chicken instead of fish. If you’re not sure what kind you like, perhaps consider getting an assortment box like we did at Dillons. In a restaurant, this will be a little tricky so perhaps go with a group of friends and each person get a different roll and share among all of you. You can also go to Sushi House where they bring you samples while you wait. What kinds of sushi do you like? What tips do you have for a first-timer? We are huge sushi/sashimi fans, but I will admit that we are spoiled by our favorite sushi chef, Alex, at Ocean’s in Little Rock. Typically, we just let him fix something original for us and don’t even look at the menu. Based upon several recommendations, we tried Kobe in Bentonville and found it to be the best of all we’ve tried in NWA. I love, love a good quality raw ahi tuna– the kind that just melts in your mouth. That’s hard to get here in landlocked Arkansas.